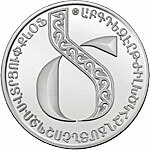 In the central part of the coin there is a coat of arms of the Republic of Macedonia. 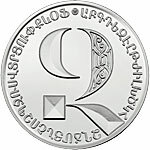 Around the coin there are inscriptions: "Republic of Macedonia", "10 Denars" (in Macedonian), "11,80G" (weight of the coin), "2018" (the year of issue) and the hallmark "AG999,9". The coin has the shape of an ancient cart wheel. 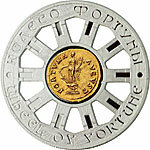 In the centre a replica of a gold Roman coin Aureus with Fortuna, with the inscriptions: "AUGUST" and "FORTUNA". 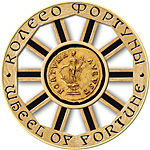 Around the coin there are inscriptions: "WHEEL OF FORTUNE" (in English and Russian). Peter I was a great fan of labyrinths. He was an author of one of them, in Lower Garden in Peterhof, which was constructed under the plan of French expert Jean Baptiste Leblond. The labyrinth, called "Garden Near the Pavilion Temple," is a square area of about two hectares. In its center is an oval pool, from which eight tracks diverge; they cross the circular walkway and separate the land into sixteen sections, in which flowers are planted. 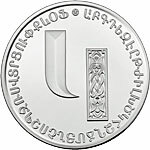 In the upper part of the coin there is a coat of arms of the Republic of Macedonia, below the year of issue 2017. 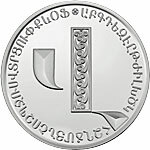 In the centre of the coin there is a depiction of a labyrinth and 2 wholes. 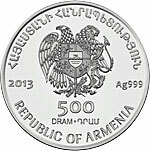 Around the coin inscriptions: "Republic of Macedonia" and "100 Denars" (in Macedonian) and "PER ASPERA AD ASTRAM". 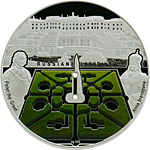 In the central part of the coin there is a labyrinth in Lower Garden in Peterhof (Russia) with a fountain in th centre, at the background the Palace. Two statues, on the left of Peter th Great, on the right of Anna Ioannovna, who continues the work of Peter I. At the background the Palace. 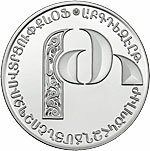 Inscriptions: "RUSSIAN LABYRINTH" (in the centre of the coin) and the "Peter the Great" and "Anna Ioannovna" (around the coin), at the bottom hallmark "Ag925". 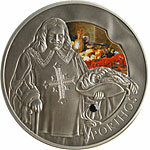 In the center of the coin there is an effigy of the Queen Elizabeth II. Around the coin inscriptions: "Elizabeth II", "One Dollar" ,"Niue", "2017", the hallmark "Ag925", and "15,55g" - weight of the coin. 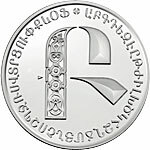 In the centre of the coin there are two white pigeons. On the left an image of the sunset at the sea-side, on the right hand side at the top - engraved faces of a girl and a boy. Below an insert of a stone in a shape of a heart. 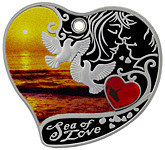 Inscription "Sea of Love". 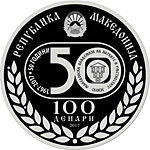 The upper part of the coin presents the coat of arms of the Republic of Macedonia and the inscription "Republic of Macedonia" in Macedonian language The central part of the coin contains the inscriptions "1967 - 2017 50 years" and the number 50, where in the center, there is the logo of the "Macedonian Academy of Sciences and Arts Skopje". 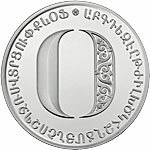 At the bottom of the coin there are inscriptions" "100 denars" and the tear of the publication "2017". 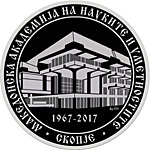 The central part of the coin depits the building of the Macedonian Academy of Sciences and Arts, and underneath there are inscriptions "1967 - 2017" and "Ag925". 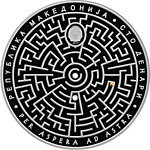 Along the primieter of the coin there is the inscription "Macedonian Academy of Sciences and Arts Skopje" in the Macedonian language. 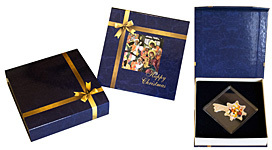 The set consists of 3 coins with Mother of God, Jesus Christ and St. Nicholas the Wonderworker packed in a wooden box in a shape of triptych. 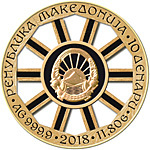 In the center of the coin there is the coat of arms of the Republic of Macedonia and inscriptions: "10 Denars" and "Republic of Macedonia" in the Macedonian language as well as the year of the issue "2017". 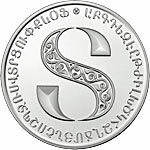 In the center of the coins there are images of Mother of God, Jesus Christ or St. Nicholas the Wonderworker (accordingly) based on the old icons. At the background and around the coins ornaments. 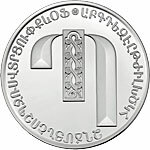 The coin is dedicated to Mother Teresa, born in Skopje (Republic of Macedonia), religious sister and missionary, founder of the Roman catholic religious congregation ""Missionaries of Charity", Nobel Prize laureate from 1979, beatified in 2003 as "Blessed Teresa of Calcutta". She will be canonized in 2016. 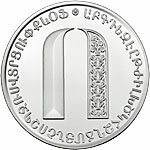 The coin is issued in cooperation with "Mother Teresa Memorial House" in Skopje. 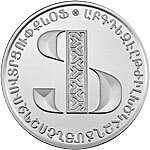 A donation to the "Mother Teresa Memorial House" in Skopje will be done from the income received from the sales of this coin issue. 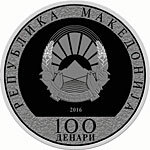 In the center of the coin coat of arms of the Republic of Macedonia and an inscription "2016" - year of the issue. 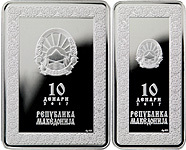 Around the coin inscriptions in Macedonian language: "Republic of Macedonia" and "100 Denars". 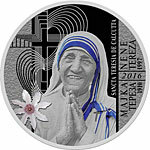 In the center of the coin a statue of Mother Teresa. On the left - at the background - ornaments in a shape of cross and heart and a clematis flower "Matka Teresa" ("Mother Teresa") bred by Stefan Franczak, Polish Jesuit monk. On the right inscriptions: "Sancta Teresia de Calcutta", "MOTHER TERESA" (in Macedonian and Albanian) "1910" and "1997" (years of her birth and death) as well as "2016" - the year of her canonization. 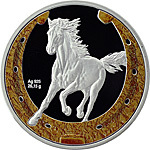 Horseshoe is very often kept as a talisman and is said to bring luck. 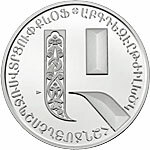 On the top of the coin coat of arms of the Republic Kazakhstan and the hallmark of Kazakhstan Mint. 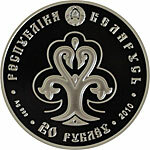 In the centre inscriptions" "100 TENGE", "Ag 925" and the weight of the coin "31,1g". 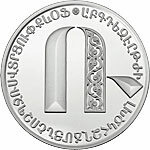 Around the coin ornaments and inscriptions in English and Kazakh "NATIONAL BANK OF KAZAKHSTAN". 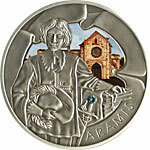 The "Colosseum" set consists of 2 coins: "Fortius" and "Citius". Effigy of Elizabeth II. 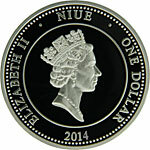 Inscriptions: "Elizabeth II" , "Niue Island" as well as "2014"and "One dollar". 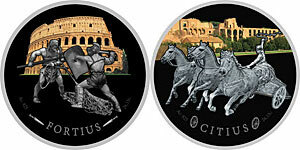 "FORTIUS": in the centre of the coin 2 fighting gladiators, Colosseum in Rome on the background. 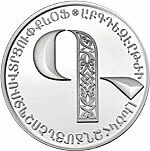 On the bottom of the coin inscriptions: "Ag 925", "FORTIUS" ("stronger" in Latin) and "26,15g" - weight of the pure silver in the coin. "CITIUS": in the centre of the coin a scene of a chariot race in the ancient Rome in Circus Maximus (Big Circus), quadriga with 4 running horses, Palatine on the background. 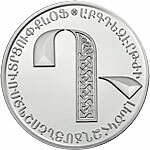 On the bottom of the coin inscriptions: "Ag 925", "CITIUS" ("faster" in Latin) and "26,15g" - weight of the pure silver in the coin. 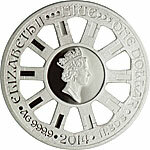 In the center of the coin effigy of Queen Elizabeth II. Around the coin ornaments, inscriptions: "ELIZABETH II", "2015", "NIUE" and "1 DOLLAR". On the right hand side of the coin a scene of adoration of the Magi. 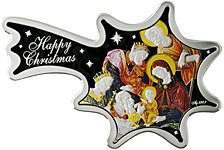 Inscriptions: "Happy Christmas" and "Ag 999,9". In the centre effigy of the Queen Elizabeth II. Around the coin inscriptions: "ELIZABETH II", "NIUE", "ONE DOLLAR", "11,80G" (weight of the coin), "2014"and the hallmark "AG999,9". The coin has the shape of an ancient cart wheel. In the centre a replica of a gold Roman coin Aureus with Fortuna, with the inscriptions: "AUGUST" and "FORTUNA". Around the coin inscriptions: "WHEEL OF FORTUNE" (In English and Russian). 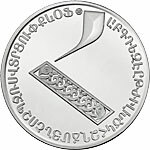 First coin from the series "Olympic games", issued by the National Bank of the Republic of Tajikistan in connection with the XXII Olympic Games in Sochi (Russia). 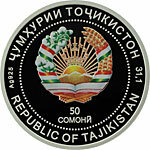 In the centre of the coin coat of arms of the Republic of Tajikistan and inscription in Tajik language "50 Somoni". 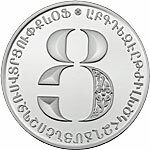 Around the coin: inscription in Tajik and English "Republic of Tajikistan", as well as "31,1" and the hallmark - "Ag 925". 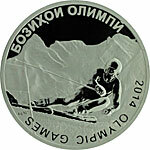 In the centre of the coin a skier during a slalom, mountains on the background. 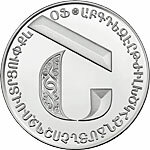 Around the coin inscriptions: OLYMPIC GAMES (in Tajik and English), "2014" and the hallmark Ag 925. 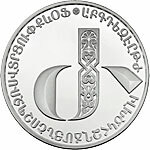 Next coin from the series "Olympic games", issued by the National Bank of the Republic of Tajikistan in connection with the XXII Olympic Games in Sochi (Russia). 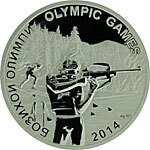 In the centre of the coin a shooting biathlete in the standing position, on the second plan running biathlete. On the background forest and mountains. 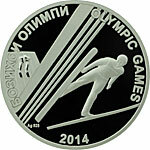 Around the coin inscriptions: OLYMPIC GAMES (in Tajik and English), "2014" and the hallmark Ag 925. 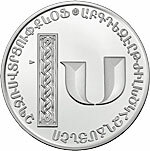 In the centre of the coin coat of arms of the Republic of Armenia, below inscription "5000 Dram" (in Armenian and English) Around the coin inscriptions: "Republic of Armenia" (in Armenian and English), "2013" and the hallmark "Ag 999". 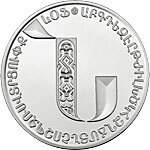 In the centre of the each coin a letter from Armenian alphabet. 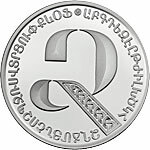 Around the coin all Armenian letters. The Orlovsky Trotter (also known as Orlov, Orlov Trotter. 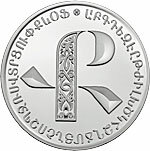 Russian: Oрловский рысак) is a most famous Russian horse. The breed was developed in Russia in the late 18th century by Count Alexei Orlov at his Khrenovskoy Stud farm near the town of Bobrov (Voronezh guberniya). Effigy of Elizabeth II. 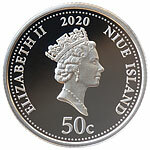 Inscriptions: "Elizabeth II" , "Niue Island" as well as "2013"and "One dollar". In the centre of the coin an Orlovsky Trotter jumping over an golden horse-shoe. Inscriptions: "Ag 925" and "26,15g" (weight of pure metal). The Iverskaya Chapel at the Resurrection Gate was one of the most honoured of Moscow's holy places. For the protection of the icon from the wind and rain a small wooden shed has been made and later, in 1680, a chapel was built. A wooden chapel was rebuilt in 1746, and became the final form in 1791 when it was rebuilt in stone by architect Matvey Kazakov. In 1929 the chapel was closed and demolished in one night - from 28 to 29 July 1929. In November 1994, Patriarch Alexy II blessed the chapel, 1995 the chapel was opened again. 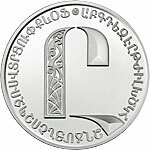 The "Iverskaya chapel" coin is the first coin in the "Chapels" series. 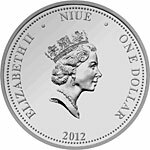 Wizerunek Elżbiety II, archanioł Michał z kopuły kaplicy, napisy: "Elizabeth II", "Niue Island", "2012", "1 dollar", "26,15 g" (zawartość czystego srebra) oraz "Ag925". Coloured image of Iverskaya chapel, on the background engraved image of Resurrection (Voskresenskyie) Gate on the Red Square in Moscow, inscriptions: "IVERSKAYA CHAPEL" and "MOSCOW". Quality Proof with pad printing, protextion against oxidizing. 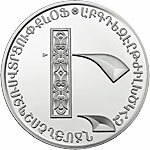 The coin set issue is related to the 2012 phenomenon comprises a range of beliefs according to which cataclysmicor transformative events will occur on 21 December 2012. This date is regarded by some predictions as the final event of history, the ultimate destiny of humanity - commonly referred to as the "end of the world" or "end time". The 21st of December 2012 is the final date of a 5,125-year-long cycle in the Mesoamerican Long Count calendar. Various astronomical alignments and numerological formulae have been proposed as pertaining to this date, though none have been accepted by astronomers or other scientists. 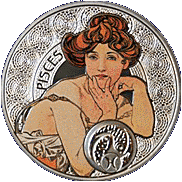 The "Apocalypse" coin set issue represents an optimistic, New Age interpretation of this end-date which means that this date marks the start of time in which Earth and its inhabitants may undergo a positive physical or spiritual transformation, and that 2012 marks a BEGINING of a NEW ERA (as opposition to the end of the human civilization). 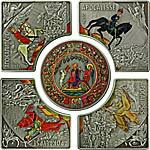 The design of the Apocalypse coin set is based therefore on this optimistic vision and presents four Apocalypse horsemen surrounding the Saviour who keeps the divine order of the universe and controls the struggle between good and evil. 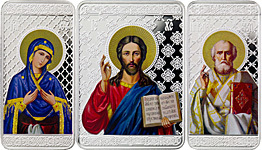 Design of the coin set is based on pictures from an illuminated series of manuscripts of St. John Apocalypse (last book of the New Testament - Book of Revelation of Jesus Christ to St. John the Evangelist), written in the 1st half of the 14th century, based on the German text, by Heinrich von Hesler (born in Thuringia, living at the turn of 13th and 14th centuries). The series of illuminated Hesler's Apocalypses was written to order of Luder from Brunswick (being Grand Master of Teutonic Knights between 1331-1335). In this day and age, only three copies from that series survived - the oldest one is kept in the Württembergische Landesbibliothek in Stuttgart (Germany), two others - in the library of the Nicolaus Copernicus University of Torun (Poland). 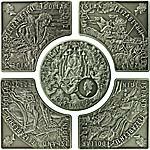 Scenes from the Albrecht Durer famous series of 15 woodcuts "The four horsemen of the Apocalypse"; on each coin effigy of Elizabeth II, inscriptions: "Niue Island", "Elizabeth II", "1 Dollar","2012". the horseman on the red horse is often taken to represent War. On the background of each reverse - engraved images showing corresponding themes depicted on the glass stained window of the All Saints' Parish church, (Falmouth, Cornwall). 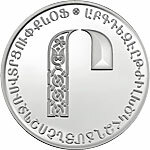 On the central internal round coin there is a drawing of the governing Saviour - having power to control the power of evil and mitigate its negative influence on humanity. 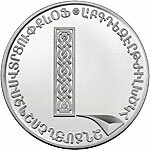 On each coin inscription: "Apocalypse" (in one of the following languages: English, German, Italian, Russian, Spanish/Latin), and the hallmark "Ag925". Packaging All 5 coins packed in one square acryllic capsule (100x100 mm) and a box resembling an ancient book (design based on the cover of the 14th century manuscript of Apocalypse), containing also a sheet of pergament (parchment) presenting a perfect copy of the original illustration (that formed a base for coins designing), printed on parchment, with hand painted gold ornaments, with a certificate. 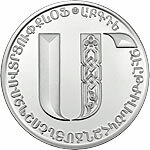 The coin is dedicated to Alexander Nevsky (1220-1263), Prince of Novgorod, Grand Prince of Vladimir, the Saint of Russian Orthodox Church. Alexander Nevsky and his troops defeated the Livonian branch of the Teutonic Knights during the Battle of the Ice (also known as the Battle of Lake Peipus) on 5th April 1242. 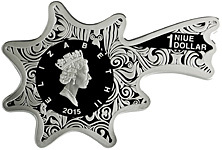 Standard image of effigy of Elizabeth II, inscriptions: "Elizabeth II", "Niue", "One dollar", "2012". 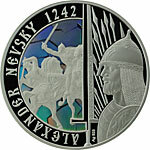 On the right part of the coin Alexander Nevsky's profile in armour, with a helmet on his head, pikes on the background, next to him a sword. 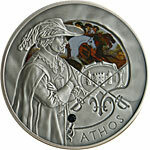 On the left part of the coin two knights on horses fighting with swords, on the background hologram imitating ice. Inscriptions: "Alexander Nevsky 1242" (in Russian) and a hallmark "Ag 925". "Love tree" is designed in the Faberge style although it is not a copy of any of the Faberge eggs designs. 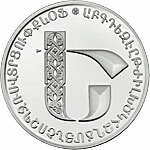 The coin has rich ornaments executed with the use of different monetary technologies - gold colorising, selective polishing of the relief and zyrcon insert. An open Faberge egg and an angel below, surrounded by ornaments, effigy of the Queen Elizabeth II. 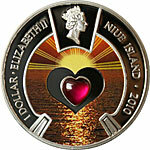 Inscriptions: "Niue Island", "Elizabeth II", "One dollar", "2013" and "Ag925". An engraved ornament in a form of a tree with green painted leaves and a green heart (zirconium insert) in the centre. Under the tree - two cupids wit bows and a gold inscription "Love Tree". 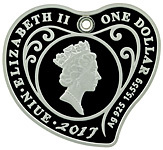 Standard effigy of Elizabeth II, inscriptions: "Elizabeth II", "Niue", "One dollar", "2012". 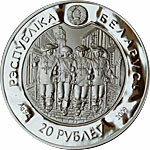 Engraved image of Athos, Porthos, Aramis and dArtagnan, on the background of a street with tall houses, inscriptions Republic of Belarus and 20 Roubles (in Belarussian language), 2009, and Ag 925. Artillery of the Russian Army: Coloured image of an artilleryman in an uniform standing near a cannon. On the background running soldier, a cannon and a soldier on a horse firing a gun. Around the coin dark blue and red arrows. Inscription: "Artillery of the Russian army" (in Russian) and the hallmark "Ag 925". Cavalry of the Russian Army: Coloured image of a horse with a cavalryman holding a sabre over his head. On the background two cavalrymen. Around the coin dark blue and red arrows. Inscription: "Cavalry of the Russian army" (in Russian) and the hallmark "Ag 925". Infantry of the Russian Army: Coloured image of an infantryman with a gun. On the background three infantrymen, two with the guns, one with a sabre. Around the coin dark blue and red arrows. Inscription: "Infantry of the Russian army" (in Russian) and the hallmark "Ag 925". Commanders of the Russian Army: Coloured image of general Mikhail Illarionovich Kutuzov in an uniform and a long military coat. On the background prince Mikhail Bogdanovich Barklay-de-Tolli and Emperor Alexander I on a horse. Around the coin dark blue and red arrows. Inscription: "Commanders of the Russian army" (in Russian) and the hallmark "Ag 925". The series is dedicated to most popular music styles. 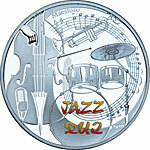 The first coin in the series presents Jazz. 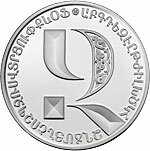 Another coin being currently in designing is planned for the year 2011. 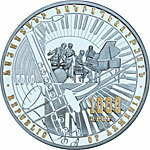 Design with a small jazz group, musical instruments and piano keyboard, coloured (gold) inscription, "Republic of Armenia" (in Armenian and English), 1000 Dram and "2010". Design with musical instruments used in jazz, and notes from the famous "Armenian rhapsody" (for two pianos), by two Armenian composers (A. Babadjanian and A. Rutiunian), coloured inscription "Jazz" in English and Armenian, the hallmark "Ag 925". 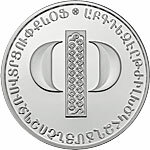 Gift coin designed in a form of key. There is a slavic superstition associated with moving to new home, a cat entering as a first a new home brings luck to its inhabitants. 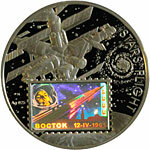 The 'Stars flight' coin is dedicated to the exploration of the space. 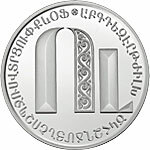 The coin will be available in early February 2012. Standard effigy of Elizabeth II. 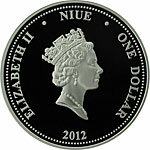 Inscriptions: "Niue Island", "Elizabeth II" , "One Dollar" and "2012". A space station "MIR" (first modular space station, operated in low Earth orbit from 1986 to 2001) on the background of a spiral galaxy. On the coin a hologram (imitation of a stamp presenting a starting rocket, a cosmonaut's photograph, inscriptions on a hologram : "Vostock" (in russian), "12-IV-1961" and "CCCP". 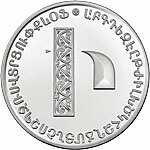 Inscriptions on a coin: "Stars flight" and "Ag 925". Standard effigy of Elizabeth II on the background of the composition of fishing hooks. Inscriptions: "Niue Island", "Elizabeth II" , "One Dollar" and "2012". 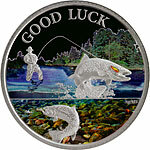 The image of an angler standing in water up to the knees, holding rode with a caught pike. Lake plants in the background. Inscriptions: "Beginner"s luck" and "Ag 925". "Love, love, love" is designed in the Faberge style although it is not a copy of any of the Faberge eggs designs. 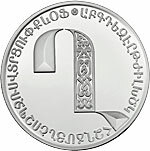 The coin has rich ornaments executed with the use of different monetary technologies - gold colorising, selective polishing of the relief and zyrcon insert. An open Faberge egg and an angel below, surrounded by ornaments, effigy of the Queen Elizabeth II, inscriptions: "Niue Island", "Elizabeth II", "One dollar", "2011" and "Ag925"
Two Cupids with bows and zircon heart surrounded by ornaments, bunch of flowers and inscription "Love, love, love". 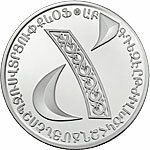 The collector coin of SLovyanka is issued as a preparatory step for a pan-Slavonic bullion coin program The 2010 issue includes two coins - silver 1 oz. Ag999 and gold 1 oz. 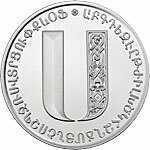 Au999. 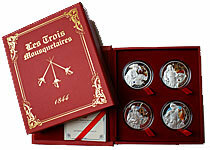 In the following years the bullion quality coins are supposed to be issued together with the collector versions. 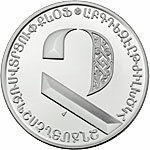 Stylised design with "derevo zhizni" ("Tree of Life"), Inscriptions: "Republic of Belarus" (in Belorussian), "20 Roubles", and "2010", "Ag 999". 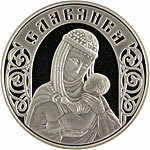 A picture of a lady in traditional (historical) Slavic dress with a child, and traditional Slavic ornaments around. Inscription "Slovyanka" in Belorussian language. 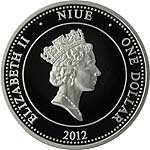 In a stylised horse shoe (placed along the rim): effigy of Elisabeth II, inscriptions Niue Island, Elisabeth II and 1 dollar as well as 2010. 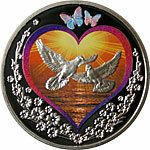 On a background of a rising sun with a mirrored heart a zircon red heart insert. Coloured design with two pigeons inside a heart, with two coloured butterflies and engraved flowers around. 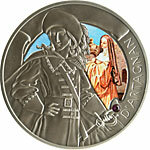 dArtagnan: Engraved image of dArtagnan in a military uniform, and his name in French, coloured design with a frocked nun, zirconia as a head of dArtagnans sword. 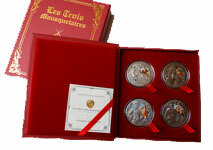 This silver commemorative coin set of "Alexander Pushkin's Fairy Tales" series, containing five coins: "The Tale of the Golden Cockerel", "The Tale of the Fisherman and the Fish", "The Tale of the Dead Princess and Seven Epic Heroes", "The Tale of Tsar Saltan", "Ruslan and Ludmila", has been issued by the National Bank of the Republic of Belarus in connection with the 210th anniversary of this great Russian Poet. 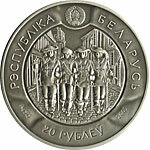 A.S. Pushkin bust on the background of a traditional ornament with a book and an ancient pen, coat of arms of the Republic of Belarus and inscriptions: Republic of Belarus, 20 Roubles (both in the Belarussian language) as well as 2010 and the hallmark - Ag925. "Ruslan and Ludmila": Coloured image with Ruslan and Ludmila on a bridge, in the "palikh" style, the fairy tale title and a stylised ornament engraved.